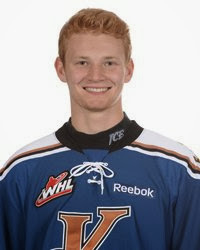 It has been a very up and down WHL playoff run for Mackenzie Skapski (NYR 2013 6th) of the Kootenay Ice as when he has been lights out "3 stars of the game" good but when he has not been then it has turned into a nightmare for the young goalie. Game 6 of the WHL Eastern Conference semifinals was played in Cranbrook, British Columbia home of the Kootenay Ice and this was a dandy of a game except for the result as Kootenay lost 2-1 and are now facing a game 7 on Wednesday night in Medicine Hat. Skapski was the game's 3rd star but I would have given him the first as he did a great job keeping his team in a game coming off a 9-2 loss in game 5. Skapski can't be faulted for either goals that the Tigers scored and Ice coach Ryan McGill was not a happy camper on what turned out to be the game winner. That game winner came with just 36 seconds in regulation and to be honest it is really hard to tell if the goal really was in or not. That appears to be the biggest issue in junior hockey as the goal replay system sometimes is not the same system the folks see in the arena. Skapski had a stellar performance stopping 28 out of 30 shots but boy did he not get any real support form his teammates in this one. Medicine Hat comes in already psyched because of their game 5 win and dominated the first period scoring an even strength goal while holding the Ice to just 5 shots. The second period showed a little more effort from the Ice but they still couldn't solve Medicine Hat's goalie Marek Langhamer until late in the 3rd period when the Ice finally tied the game. But it was not to be as Medicine Hat gets to send this series back home for a game 7 on Wednesday. The Bridgeport Sound Tigers who are the Islander's AHL team had Ryan Pulock (2013 1st), Kyle Burroughs (2013 7th) and Jesse Graham (2012 6th) playing defense on Monday with Victor Crus Rydberg (2013 5th) playing center. The Sound Tigers are not going to make the AHL playoffs but it was nice to see these 4 getting some AHL action under their belt. Especially happy to see Graham getting a shot as he is one draft pick that the Islanders need to make a decision as to whether or not to sign. In 5 games Graham has been 1-2-3 -1 for the Sound Tigers.